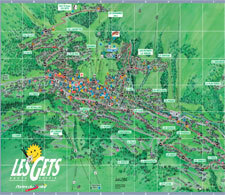 There are routes to suit everyone from first time riders to competitive downhill enthusiasts. Like the winter ski pistes, the trails are marked from green (easy) to black (difficult). The trails are very well signposted and the lift staff are always happy to point you in the right direction. If you want to explore the cross country more it is worth while chatting to us about the many local trails that take you to places with stunning views and a good selection of rooted and rocky runs. It is possible to hire a local guide from the MCF centre in Les Gets, but we are normally out and about on our bikes and happy to ride with you to make your day more enjoyable. 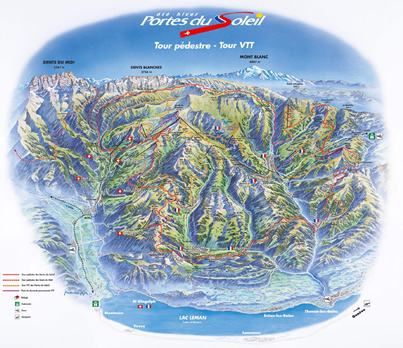 If you are looking for action and adventure, then the Portes Du Soleil will not disappoint in the summer months. The Mountain Biking (VTT) Tracks are suitable for all standards, from beginner to pro. Stunning views across the alps and nerve jangling descents combine to provide some of the most breathtaking routes in the world. The fact is you can head off in the morning from our Chalet and cycle all the way over to Switzerland for lunch, then head back via the Mountain Style course in Chatel or the downhill runs in Les Crozet and Champery and still be back in time for an Apres beer! There’s plenty in the Les Gets / Morzine area to keep you entertained for a week, but if you seek more then the never ending downhill runs across the PDS will keep you entertained for years to come! With its bars, restaurants and cafes lining the village streets, Les Gets really does have a real attracting charm about it. The shops are open all summer with clothes stores, bikes shops and bike repair centres all ready to welcome you in. Click on the map opposite to see a full view of the village. There is a free bus that operates around the village and runs up both sides of the mountain. You can also take the petit train from the Chavannes side of Les Gets over to the Mont Chery telecabine. 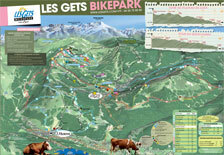 To ride your bike from Les Gets to Morzine takes about 10 minutes downhill.